Deviled eggs, in various forms, have been around for centuries. One of the earliest recipes appeared in Platina’s 15th century De honesta voluptate et valetudine. This version featured yolks that were mashed with cheese, finely chopped herbs and raisins and then stuffed back into the whites before being fried in oil. By the 16th century, the practice of stuffing egg whites with a yolk mixture had become quite common. As recipes began calling for hot and spicy ingredients, like cayenne pepper, the term “deviled” was adopted for somewhat obvious reasons (heat, devils– you see the connection). In the early 18th century, the term was often used to describe dishes cooked with spice or served with spicy condiments. 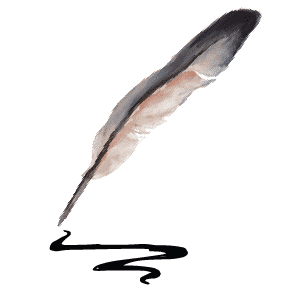 In France the phrase à la Diable is used in a similar fashion. 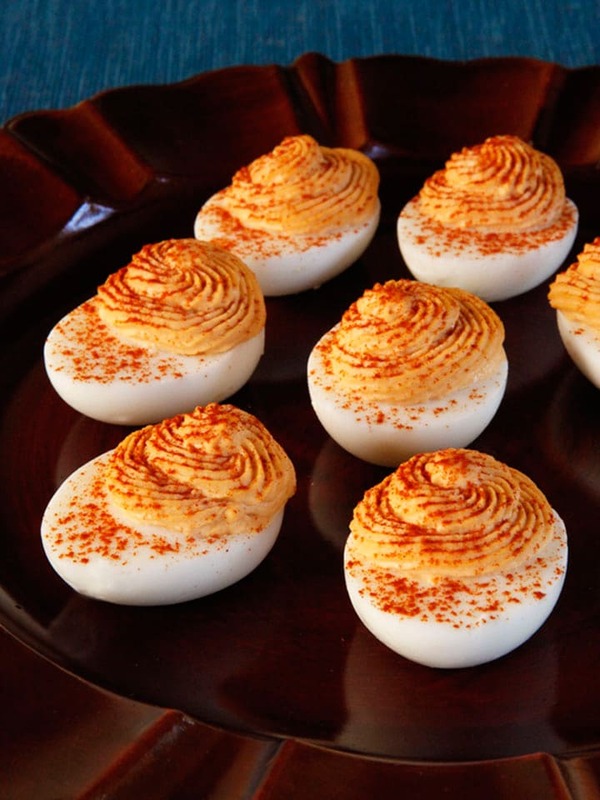 As deviled eggs became a popular treat at community events and church functions, they were referred to as “mimosa eggs” or “salad eggs” in order to avoid any unholy name connection. Though mayonnaise is often used to bind the mashed egg yolk, it did not appear in any recipes until Fannie Farmer’s Boston Cooking School cookbook in 1896 and was not commonly used until the 1940s. Interestingly, nowadays deviled eggs tend to be quite mild in flavor. Mustard is used to give them a slight kick, and sometimes a bit of mild paprika is sprinkled on top. 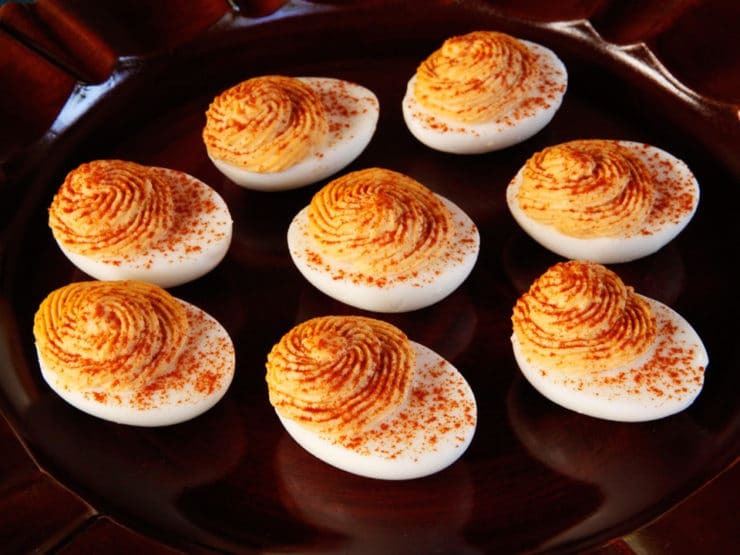 With this recipe, I decided to take deviled eggs back to their spicy “devilish” roots. I replaced half the yolks with hummus and ditched the mayo to make the recipe a bit healthier. I added sriracha (of course!) to spice things up. A sprinkle of smoked paprika brings the whole shebang together. These little guys are total flavor bombs, highly addictive. Serve them at your next soiree, and be sure to have extras on hand– they are devilishly delicious! 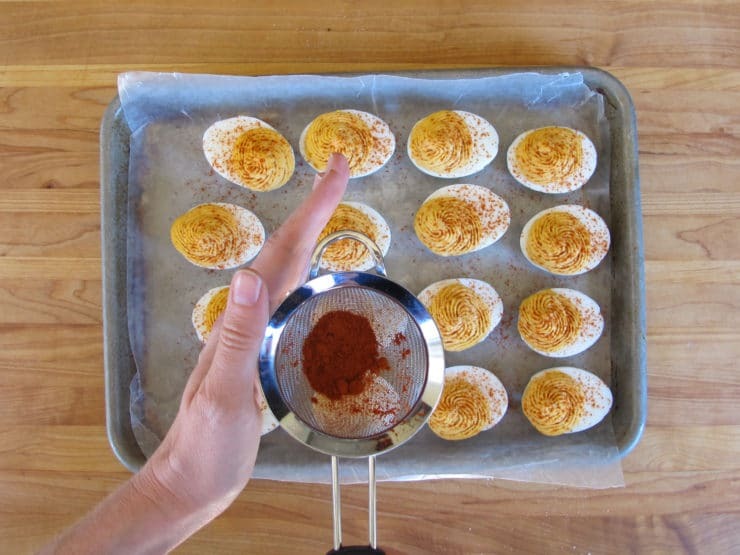 Spiced up, lightened up, smoky deviled eggs recipe. Lower cholesterol and lower fat than traditional deviled eggs, with an addictive spicy kick. Scoop out the yolks. Reserve 4 of the yolks in bowl of a food processor. 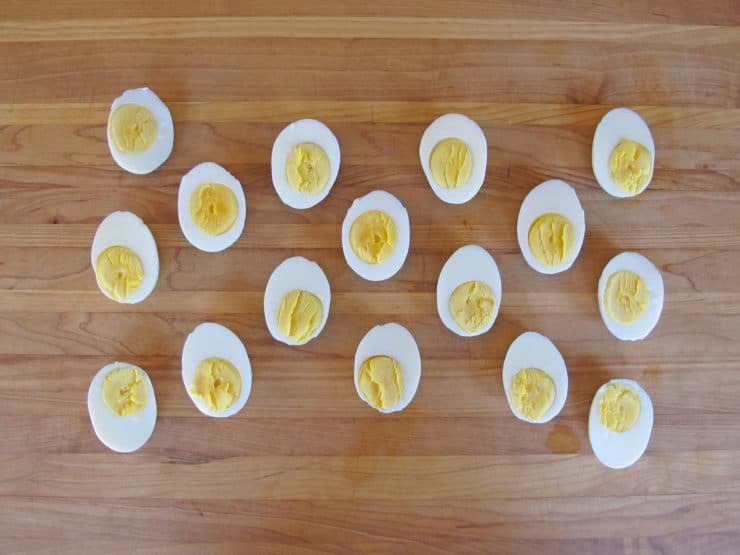 Discard the other yolks (or save them as a special treat for your dog!). Add the chickpeas, tahini, roasted garlic, lemon juice, sriracha, extra virgin olive oil, honey and salt to the food processor and process, adding the reserved chickpea liquid in small batches until mixture is smooth and easily spreadable. If you're spice sensitive, you might want to start with 1/2 tbsp sriracha and add more to taste. If you have leftover filling, place it in a small bowl for spreading on crackers. These deviled eggs can be made up to 1 day ahead and refrigerated in a covered container until ready to serve. Refrigerate them immediately after making, do not leave at room temperature for very long or they may spoil. Treistman, Ann. Who Put the Devil in Deviled Eggs? : The Fascinating Stories behind America’s Favorite Foods. New York: Skyhorse Pub., 2011. Print. Can you tell me how many calories are in each piece? Hi Emilee, Tori’s assistant Ashley here! I’m sorry, but we do not calculate the calories for Tori’s recipes. Far freaking out…gotta to try this ASAP. I am so definitely going to make these, I have my first bottle of sriracha ever and really like it! I have to be careful of sodium so will omit a lot of the salt and do this with no sodium added chickpeas or cook my own. Hi Kitty, if omitting the salt then you might also want to omit the honey, as the sweetness really won’t work well without the salt to counterpoint. Torey I read this and jumped up and made them!! I used raw garlic because I like it better and I was worried about the sweetness of roasted. The honey made the mixture too sweet for me but once they were assembled with the smoked paprika the balance was perfect. I even pipped them and they were so cute till I went to garnish with my new little strainer. The mesh was not fine enough and I got a huge snow storm, they still taste good but people might want to try their strainer out on paper first just to be sure. Delicious!! This is so different and appealing from any ‘devilled’ egg recipe I have ever made I cannot wait to try it 🙂 ! Use hommus almost daily and sriracha so cannot see a single cloud on the horizon!!!! The best party canapé ever! 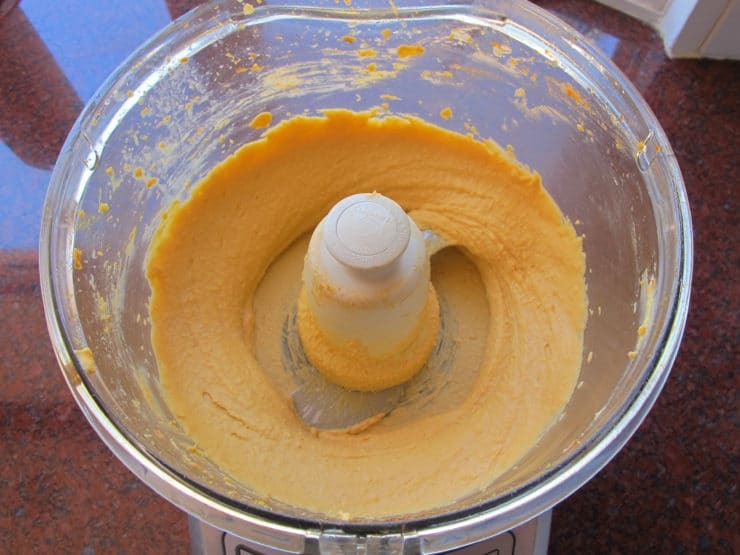 What a good idea to puree it all in the food processor! 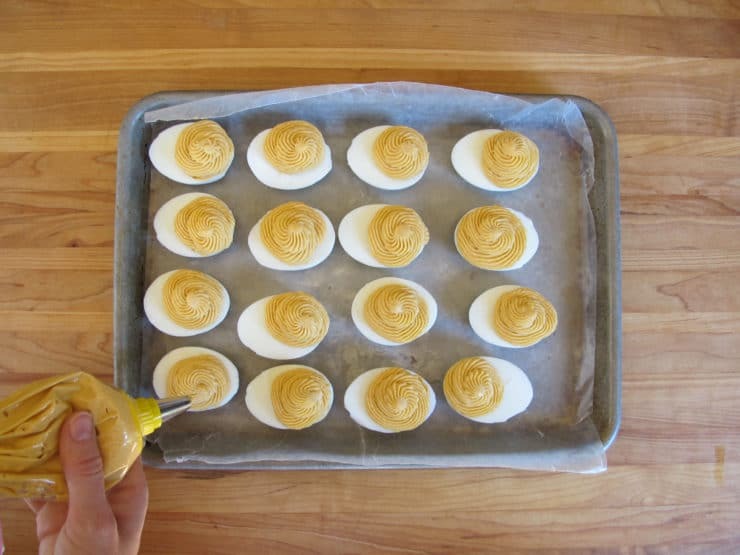 So smart, and tasty-I love me some deviled eggs! These look like what I call angel eggs yum !!!!!!! this recipe sounds yummy! Make sure you use organic garbanzo beans. All others are genetically modified. Why not use the extra yolks to make sure you have extra filling for dip? Hi Bruce– you certainly can. I omit them to cut down on calories a bit, but if that’s not a concern feel free to add them and adjust the spicing/flavors accordingly. I love how you piped those! So pretty! MMMmmmm… I can’t wait to try this. really? what an interesting concept! i love this recipe! My hubby will be so excited. He’s on a low cholesterol diet and misses deviled eggs. Thanks!! Those look SO good right now! Wow. I love everything described here. I might even like these! Ooh! That may convert my kids to deviled eggs!